Embracing my inner geek: laptop computing _ Mathias Vestergaard Corp.
My life evolves around fashion. Nonetheless, this has not always been the case. I still have an inner geek. A geek that loves computers, cell phones and other gadgets. Not only does the geek like the gadgets, he also likes to talk about the gadgets. So this is a (love) story about my personal gadgets, narrated by my inner geek. “I bought my first laptop in spring 2001. It was a hand me down Digital HiNote Ultra 2000, with 4gb harddrive and 64mb ram. Any computer experience prior to this did not count. A laptop computer was what I needed. Spring 2002, I bought my second laptop. An Acer Travelmate 360. My first (and to date most expensive) new laptop computer. It was sleek and lightweight compared to the standards at the time and featured a 20gb harddrive and a 13″ screen and I loved it. 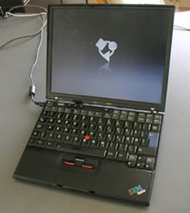 But the happy times did not sustain, and during the summer of 2003 I bought my first IBM ThinkPad: the X31. Not much faster than the Acer, but smaller, with a 12″ screen and a much better keyboard. After the X31 I knew I was never going to use anything but IBM ThinkPads, so a year later I bought my second one: an X40. Even lighter than the X31 and with a much longer battery life. The X40 was the first computer I used for more than two years. It had almost everything that I needed – and actually, my sister bought it from me when in fall 2006 I bought an X60s, and she still uses it. But in spring 2005 I also bought an Apple PowerBook G4 15″. Not as a replacement or substitute for the X40 but as a second computer. 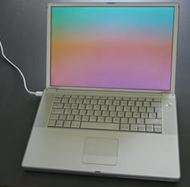 With a larger screen, larger disk and an optical drive, the PowerBook was ideal for music and video editing, which I was doing around that time (read more about the movie ‘Udsat’ here). The PowerBook lived a quiet life, while the X60s travelled with me to New York and basically everywhere I went. In fall 2008 I also acquired an X61 Tablet with built in digitizer for photoshopping, however, it was too heavy to replace my personal favourite (I sold it about a year later), the X60s, so instead I replaced the X60s with an X200s, setting new records for battery life: 11 hours was no problem on the X200s (with a new battery). Around that time I also developed a rather irrational passion for the 17″ PowerBook. For some reason I just fell in love with its odd proportions – so big and so flat. I couldn’t get my hands on the old PowerBook so I bought a used 17″ MacBook Pro to replace the 15″ Powerbook. Things are getting confusing, I know. For the past years I have used the Thinkpad X200s as my primary machine, the 17″ MBP for home and the iMac for photography, however, when Apple introduced the 2nd generation MacBook Air with 256gb SSD I sold my last Thinkpad and I am now all mac. Not cool, I know. But the Thinkpads have not evolved fast enough after Lenovo took over, and my needs have changed. 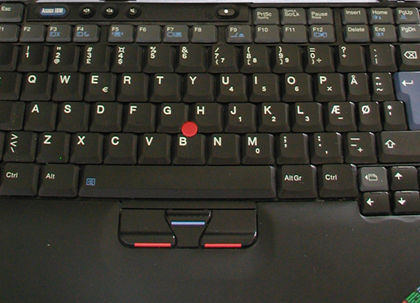 I still miss the trackpoint and the keyboard from the Thinkpad. Thinkpad FOREVER! This entry was filed under IT - Information Technology.